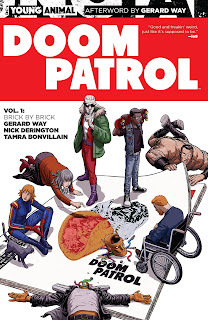 Gerard Way's Doom Patrol Vol. 1: Brick by Brick represents a "rebirth," to be sure -- the rebirth of a mainstream, superheroic mature readers line at DC Comics. And what's immediately gratifying about Doom Patrol is that it's "mature" without mistaking maturity for grittiness; rather there's a vein of optimism that pervades these pages, perhaps even more surprising as it surrounds the oft-put-upon Doom Patrol. But even as the whole band doesn't get back together in this volume on its own, enough of them happily reconnect with one another as to create something of a party atmosphere. Things never get so dire in Brick by Brick, but even when they do, there's a levity to the proceedings, buffeted in no small part by Nick Derington's art. With Tamra Bonvillain and company's bright peppy colors throughout, Brick by Brick is a breath of fresh air romp of the kind it seems DC Comics's Rebirth is meant to evoke, even if it isn't a Rebirth title itself. What is "mature" about Way's Doom Patrol is actually just the language; I'd like to think complexity does not a mature comic make (or have to make). There's no sexual situations, and the "violence" in Doom Patrol, such as it is, is almost docile in comparison to your average comic (and most of Brick's conflicts are solved by talking or catching/not catching a gene bomb). In that respect it's almost a shame that Doom Patrol has to carry the "mature readers" label, as I'd think it might shrink the audience of this title that surely ought to read it. At the same time, I consider Doom Patrol's use of language no small thing that could just be lifted out; instead, given the metaphysical heights to which Doom Patrol climbs, an occasional realistic curse (instead of mainstream comics's substitutions thereof) helps to keep Doom Patrol anchored to the ground. Way packs a lot into Brick's six issues, deceptively so. In just five of the issues, aside from introductions and Casey Brinke and company's attempt to free Danny the Street (now an ambulance) from aliens who want to use him to mass-produce food, Way also manages a tangential trip by Negative Man Larry Trainor and Robotman Cliff Steele to the Negative Zone. And that's all with the last issue dedicated to the new nascent team saving Crazy Jane from one of her personalities run amok. It would seem, with a good part of the first two issues involved with Casey arriving at "Dannyword," that perhaps Doom Patrol gets a slow start, but I'd still argue there's plenty there; Way tells the initial complete story even while devoting a page each issue to the recurring feature "What's Going on with Niles Caulder?" Again, these so-called "World's Strangest Heroes" have never been the most optimistic -- Keith Giffen's recent take on Doom Patrol turned on the characters's death-wishes -- but Way finds both hope and humor in them. Though Cliff does decry that Larry is reborn as "handsome," both seem much more resigned to their fates, to the point where Larry chooses to be recombined with the Negative Spirit in order to continue helping people. Equally "Crazy" Jane speaks eloquently and wisely (filtered now through a more modern lens) about how she'll have to manage her multiple personality disorder throughout her life. And though there's no lack of punching in the book (mostly of robotic aliens) Danny and the Patrol* defeat Torminox mainly through evoking his sympathies, and Jane is freed essentially through the team's inaction. 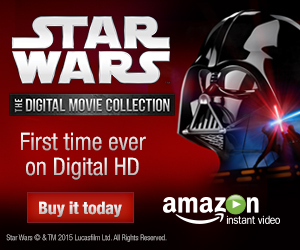 As befits this title, Way's "villains" so far are considerably removed from the typical world-conquerors. I appreciated that Way pays homage to a wide swath of Doom Patrol lore; we might expect heavy references to the Grant Morrison and Vertigo runs of this team, but Invasion! and the Oolong Island of Giffen's run both get a welcome mention. Morrison's influence remains most prominent, however, as Way brings back Jane, Danny, and Flex Mentallo all even before Rita Farr. In the Morrisonian vein, it's more than fitting that main character Casey turns out to be a comic book character made real within a comic book. When Casey opines that "we're made up of all the things that happen to us," it's both a thoughtful musing on life and also another way of looking at Morrison's theory of "real" comics characters, that their histories come from the issues upon issues in which they've appeared. It's clear even at the outset that Gerard Way is taking nothing for granted in Doom Patrol Vol. 1: Brick by Brick; that's apparent from EMT Sam Reynolds's early mention of his wife ultimately coming to the fore in the sixth issue. All of this seems likely fodder for later stories: that there's more going on in the Negative Zone, why Cliff was living in a gyro, Danny the Brick's inadvertent murder of a supergod, and also the mystery of Terry None (the book's one discordant note was when Terry killed Casey's roommate and no one seemed to notice or care). Like Y: The Last Man, Sandman, or Doom Patrols before it, Gerald Way's book seems poised for a long run that'll pay off over time; this is a fun start to the Young Animal imprint. Huge fan of the Young Animal imprint thus far (Mother Panic aside), it brings back all the old warm memories I have of the Pre-Vertigo/Early Vertigo era, but in an appropriately modern context. I mean, this iteration of Doom Patrol is basically Grant Morrison meets Jaime Hernandez. That basically has *me* written all over it. I'm thinking about buying this volume, but do I need to read Grant's run beforehand? No; I'm not exceptionally familiar with the Morrison run and I was OK. If you can dig up a Who's Who entry for Crazy Jane and Danny the Street, you're probably fine. I plan to pick up all of the Young Animal and Hannah-Barbera titles in tpb, later this year. Lots of great comics!